Ellen DeGeneres has been tapped to host next year's Oscars, the Academy of Motions Pictures Arts and Sciences said Thursday. It will be the comedian and TV talker's first time hosting the Oscars show and first appearance on the awards show. She has hosted the Primetime Emmy Awards telecast twice and co-hosted it once, and hosted the Grammys twice. Each of her Emmy Awards solo hosting gigs came after major tragedies: Sept. 11 in 2001 and Hurricane Katrina last year. "I don't know how that works out," DeGeneres told CBS Early Show co-anchor Julie Chen a year ago. "Ellen DeGeneres was born to host the Academy Awards," said producer Laura Ziskin in a statement. "I can already tell she is going to set the bar very high for herself and therefore for all of us involved in putting on the show. Now all we need is a lot of great movies." The 79th Annual Academy Awards are scheduled to be broadcast live from the Kodak Theatre in Hollywood on ABC on Sunday, Feb. 25. This year's Oscarcast, in March, was fronted by "The Daily Show" host Jon Stewart. DeGeneres is the host of the syndicated talk show "The Ellen DeGeneres Show," which has won 15 Daytime Emmys since going on the air in 2003. In April, she swept the Daytime Emmy awards for talk show and host for the second straight year. DeGeneres also starred in the ABC sitcom "Ellen," which aired between 1994 and 1998, and the CBS sitcom, "The Ellen Show," which ran 2001-2002. She has also been a regular in films and has authored several books. 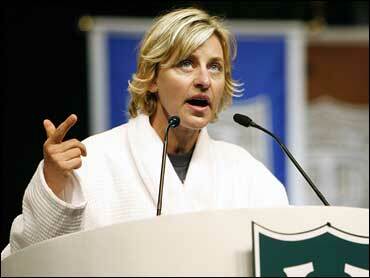 Just last week, DeGeneres walked away from a three-car accident on Sunset Boulevard in Los Angeles. A 2002 Porsche Carrera driven by a 52-year-old woman slammed into the back of the Buick and caused a chain reaction, police said. That driver was arrested on suspicion of drunken driving. "When Laura Ziskin called, I was thrilled," said DeGeneres in a statement. "There's two things I've always wanted to do in my life. One is to host the Oscars. The second is to get a call from Laura Ziskin. You can imagine that day's diary entry."